Everyone is still mourning the loss of larger than life Mob Wives star Big Ang after she succumbed to cancer on February 18th. The series aired its last episode on Wednesday followed by a tribute to everyone’s favorite Staten Islander that I couldn’t watch…to the commenter who compared the tacky special to a budget New Year’s Eve spectacle, you couldn’t have made a better comparison. That said, it was incredibly hard to watch Ang wrapping up her final scenes by revealing her cancer had returned and that she’d split from husband Neil Murphy. While Ang and Neil’s ups and downs were chronicled this season and on Couples Therapy, the pair showcased a hilarious and fun-loving side on Ang’s lighthearted spin-off. Regardless of their relationship status at the time of Ang’s death, Neil clearly loved his wife immensely, and he wants to make sure everyone knows how much he adored her. 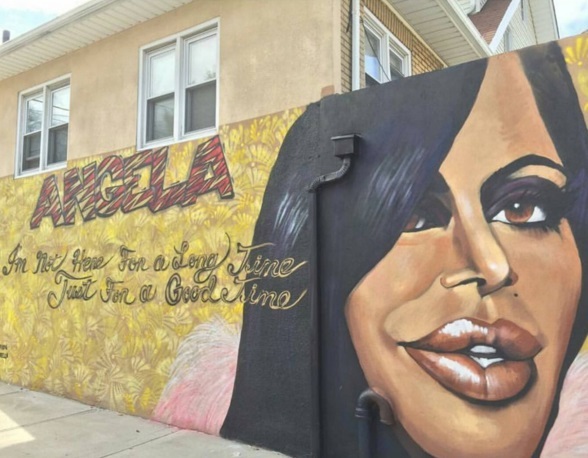 There is no doubt that Mob Wives’ Big Ang was larger than life when she was on this earth, and her Staten Island home has memorialized the fun-loving reality star in a big way. The city commissioned a mural of Ang that was unveiled in front of family, friends, and fans on Sunday morning. As the final season of Mob Wives winds down, it’s been difficult to watch Ang struggle with the return of her cancer (and subsequent clean bill of health) after losing her to cancer three short weeks ago. In the days following her death, there was unnecessary drama surrounding her co-stars, but hopefully, this mural will serve as a constant reminder to live and love as Ang did. The realization that Mob Wives’ most beloved star Big Ang Raiola has passed away from cancer still hasn’t really hit me yet. While she prided herself on her larger than life, surgically enhanced features, I think we can all agree, they paled in size compared to her giant, compassionate heart and her friendly, genuine smile. The world is a little smaller without her in it, but I am grateful she shared her vibrant personality with all of us who watched the show. Big Ang was the only reason to watch Mob Wives. As her co-stars brawl and partake in scripted drama, we could count on Ang to share no nonsense advice and sometimes humorously stirring the pot. While the current season features Ang’s second battle with cancer, here’s hoping her co-stars truly learn that there are much, MUCH more important things in life than holding grudges…if only to honor their true, sweet friend. News of Big Ang’s death has spread quickly this morning and her friends, co-stars and fellow reality TV stars took to Instagram to share their tributes. Everyone from Sheree Whitfield to Drita D’Avanzo and Renee Graziano and so many more, the stars shared their favorite pictures and thoughts about the beloved Mob Wives star. Big Ang was loved by all who met her and will be missed by so many. After a year-long battle with throat, lung and brain cancer, Big Ang passed away at 3:01 a.m. The Mob Wives star, whose real name was Angela Raiola, was just 55 years old.